Mahima as a newcomer she has given her best and she acted like an experience actress definitely she will become a good actress one proper role will change her life . Ajay Ghosh showcased his talent again and proved as best villain his performance is simply amazing . Kasi viswanath played as father to heroine he did his best . Jogi naidu role is short and perfect .Ajay is perfect as a cop rest of the cast has done proper justification to their respective roles . In this segment we must director for his brilliant screenplay even though it's a simple story his narration has taken the film to next level . Director tried his best to maintain suspense .Production values are perfect and high even their promotions are equal to high budget films we must appreciate Good Cinema Group for their promotions in all platforms which is much needed for small films where the rest of small budget film producers are failing to do . Editor Madhu editing helped a lot for this film his crisp editing made the film interesting .Cinematography is perfect Visuals are good . Dialogues can be better . Music is one of the main plus for the film background music has taken the film to next level . 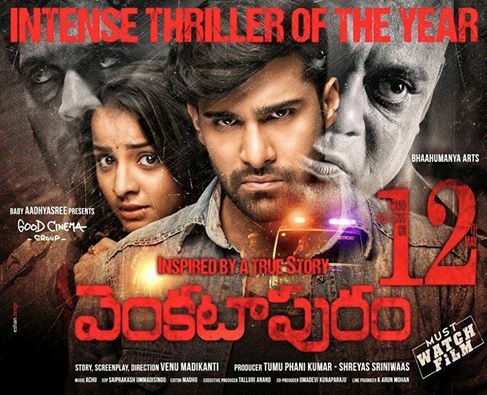 On whole i can say Venkatapuram is the impressive film with good engaging elements and perfect music definitely this film will not disappoint you watch and enjoy the film this weekend .congrats to venkatapuram team .